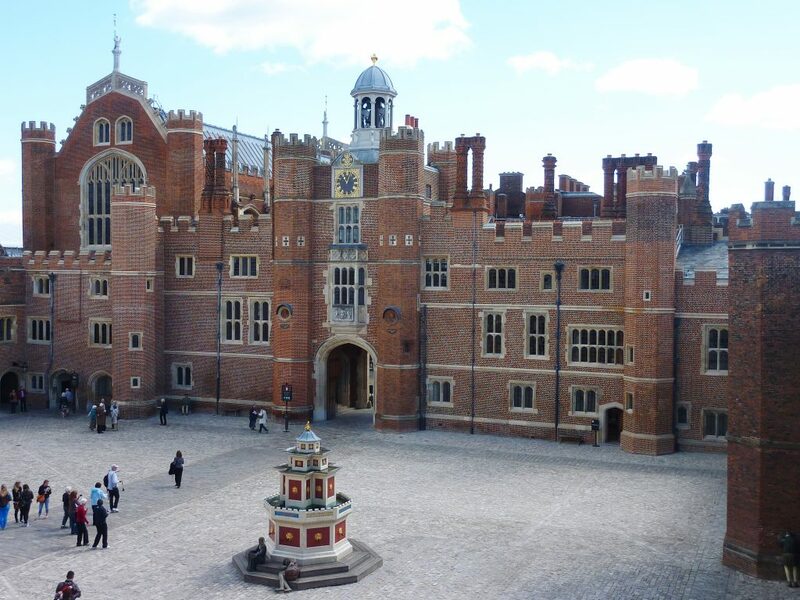 Base Court contains elements of Wolsey’s original palace and Henry VIII’s embellishments, alongside further Baroque additions by Christopher Wren and later alterations, themselves of some significance. 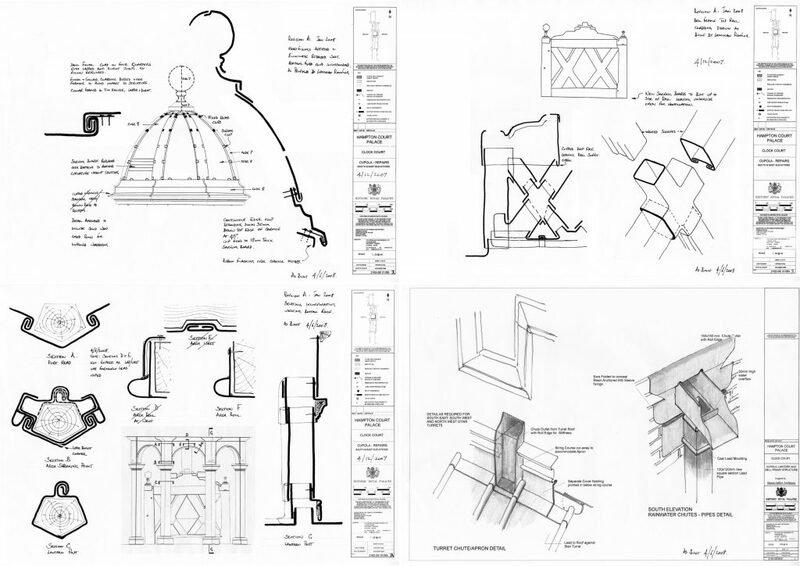 Stonework was found to be in variable condition, and a general approach was to limit replacement only to failing stones or those presenting risk to health and safety. Where stone was no longer available, alternatives were chosen on the basis of a close colour match and durability. 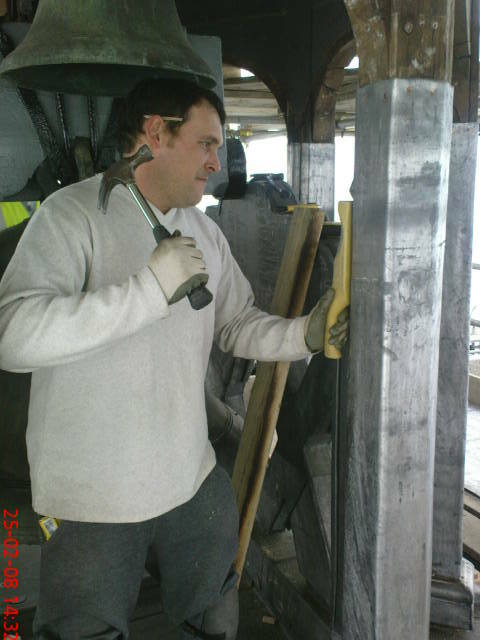 Mortar repair to existing stone was undertaken wherever possible, although some had to be replaced owing to the discovery of iron cramps upon dismantling. 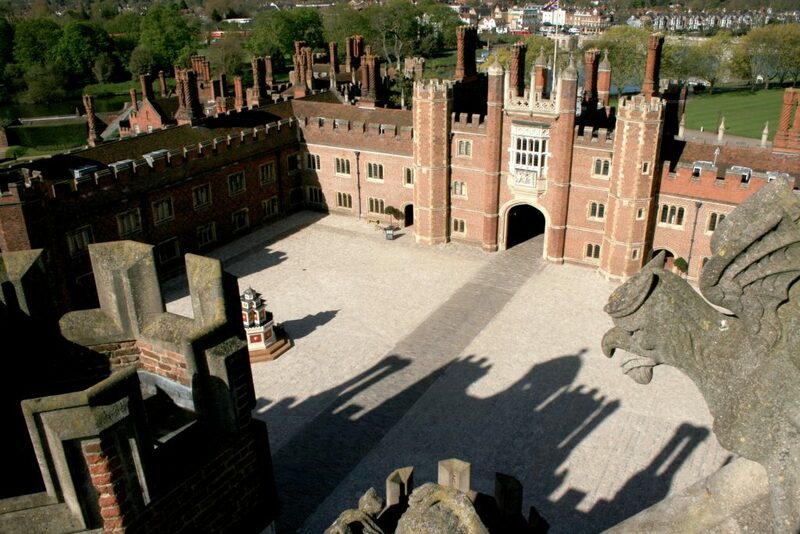 Saturation to brickwork was addressed by replacing and repairing decayed drip and string courses, and repointing in soft lime putty mortars (although excessively hard mortars were left untouched to avoid damage to brickwork). 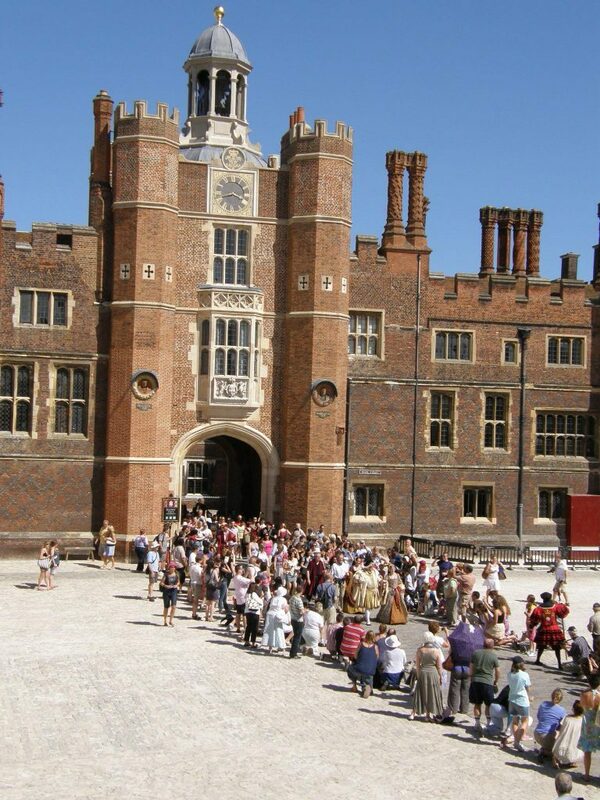 Brick repairs were individually judged and undertaken by the rate of decay relative to neighbouring bricks, and the restored outer wall surface now acts as a sacrificial jacket to the Tudor core. 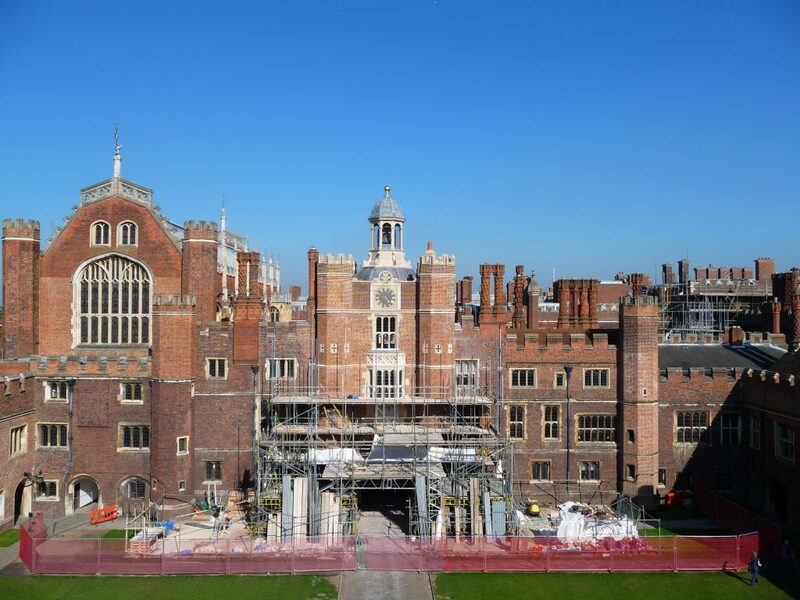 Mortar repairs were only undertaken where brickwork was threatened owing to the difficulty of achieving an acceptable match, and following thorough mortar analysis. 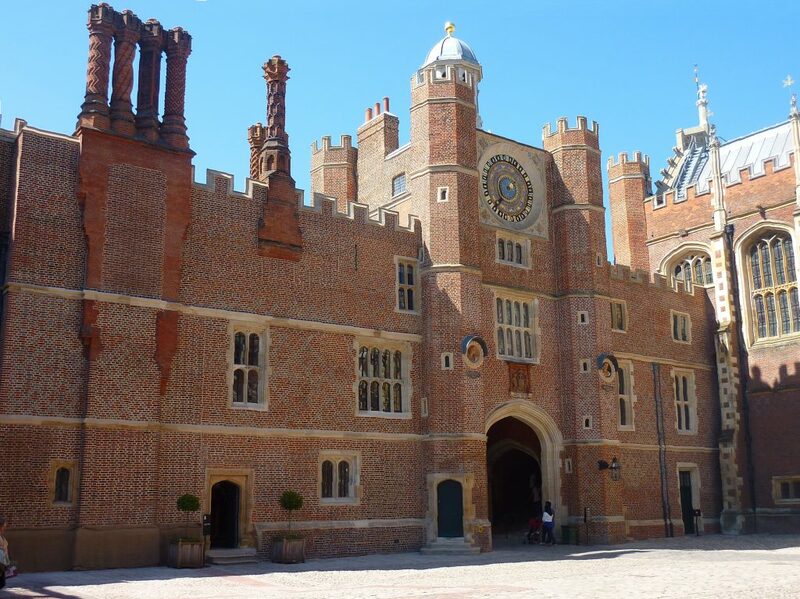 HRP’s team, with myriad external specialists, examined, analysed, researched and tested Giovanni di Maiano’s exceptional terracotta roundels were commissioned by Wolsey, and conservation work was undertaken in 2011 and 2013. Some are in excellent condition, but others were actively deteriorating. Conservation work combined traditional and modern techniques to meet the challenges presented by conserving such rare objects outdoors in the demanding British climate. 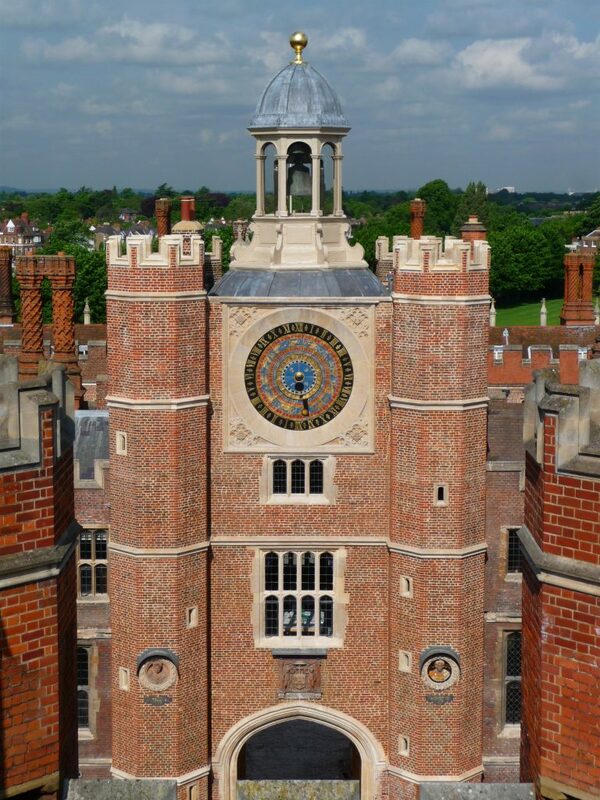 Each roundel was cleaned – using state-of-the-art laser technology – revealing wonderful hidden details. The physical repairs employed traditional lime-based mortars to reinforce and protect fragile areas. Cracks and losses were filled to prevent water penetration. Significant areas of loss were remodelled using archival photographs. This painstaking work protects the original terracotta beneath and restores the roundels to their original dramatic appearance. 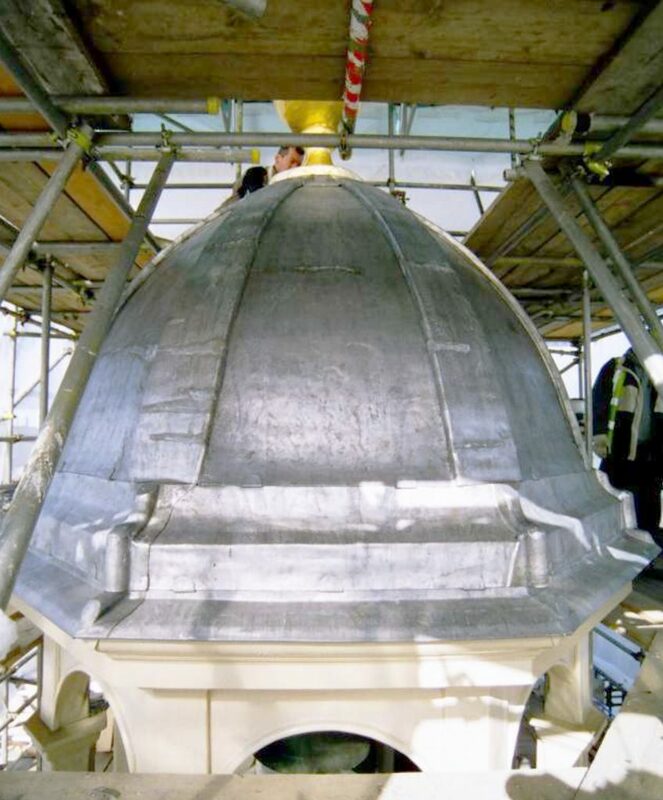 They have also been given the added protection of new, remodelled leadhoods and their name plaques re-gilded. 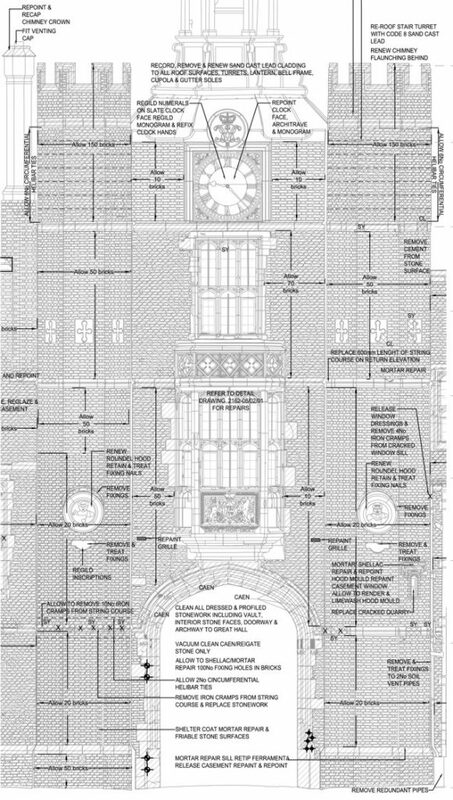 Since its creation around 1540, the Great Astronomical Clock has been repainted and repaired many times, but remains – at heart – the complex scientific instrument created for Henry VIII. 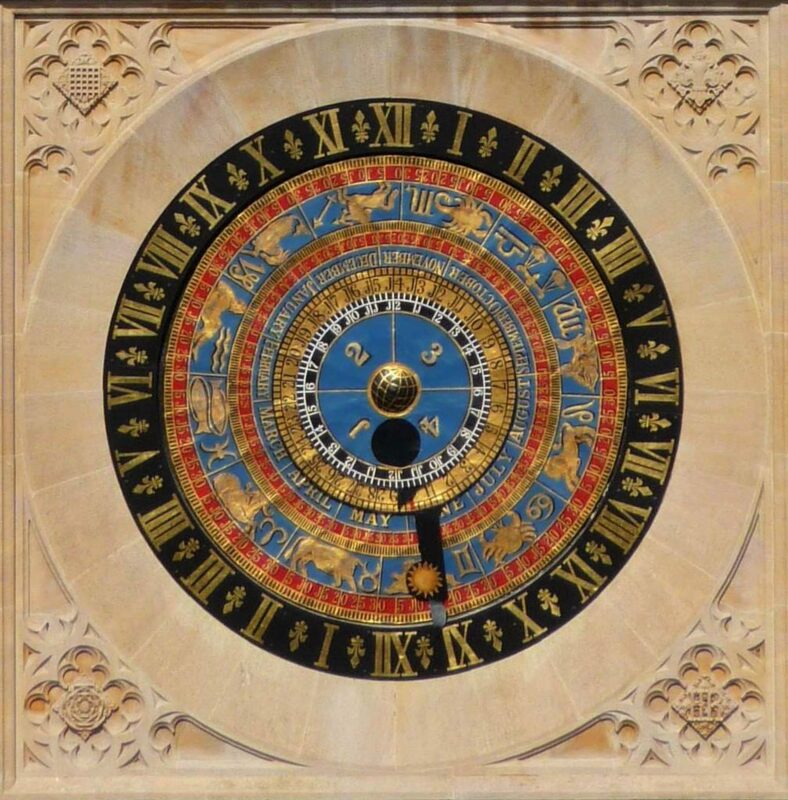 Its three dials – the largest 2.5 metres wide – were elaborately decorated within a painted frame. 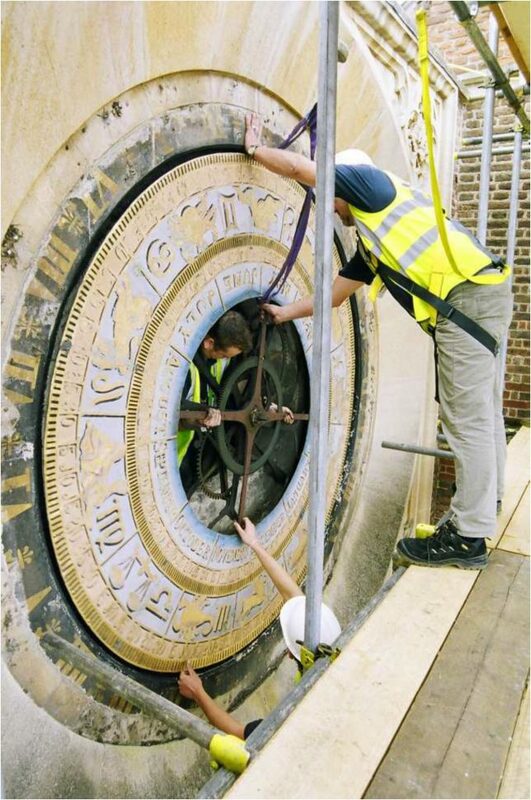 The dials and mechanism were temporarily removed and restored in 2007, and displayed to the public while all aspects of the dials and the mechanism were analysed. 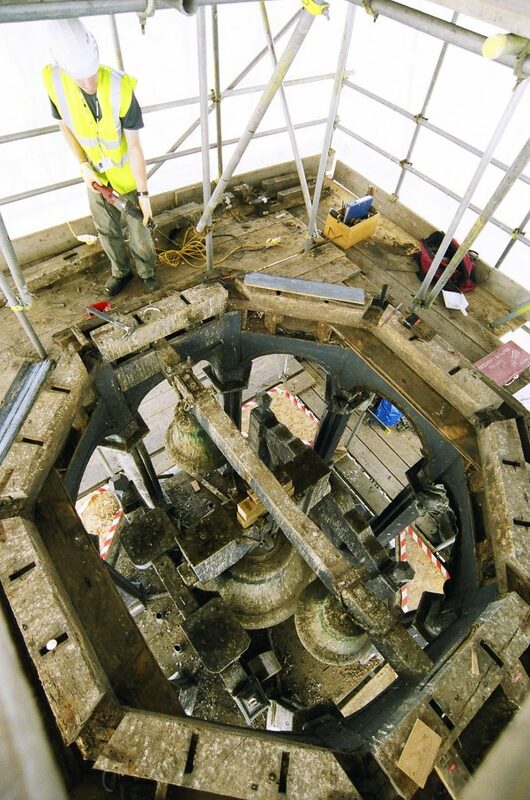 Research revealed that the dials were last painted in 1960 – following a Victorian scheme. 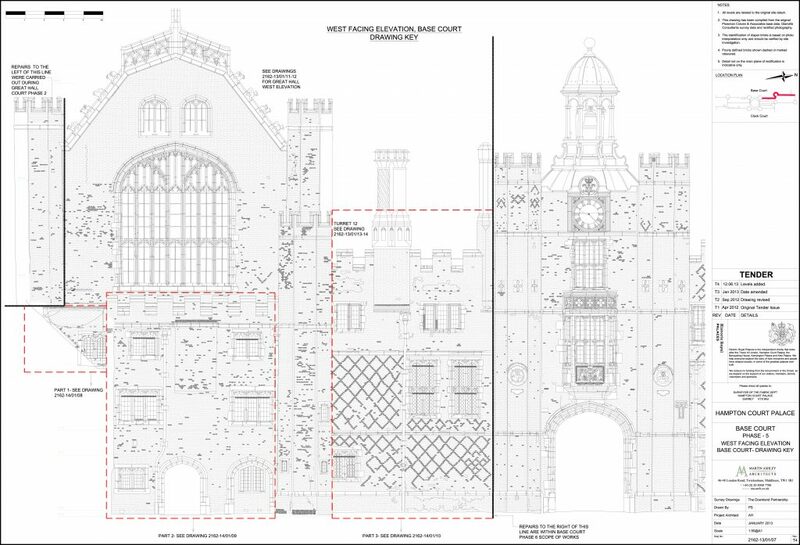 The current scheme was beautifully detailed but in poor condition, with much flaking and fading. It was decided to retain and conserve the present scheme, but to restore its original vivid character. 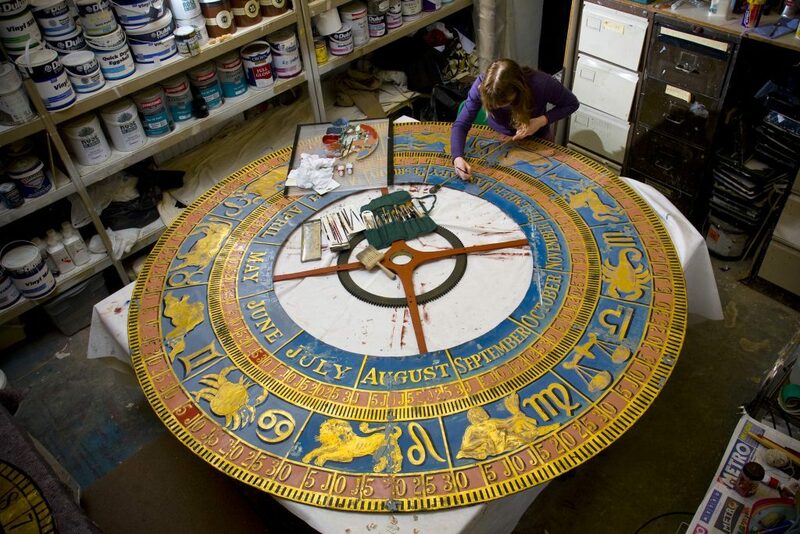 Conservators over painted the faded blue and red with bright new colours and have cleaned and retouched the gilded symbols and astrological figures. 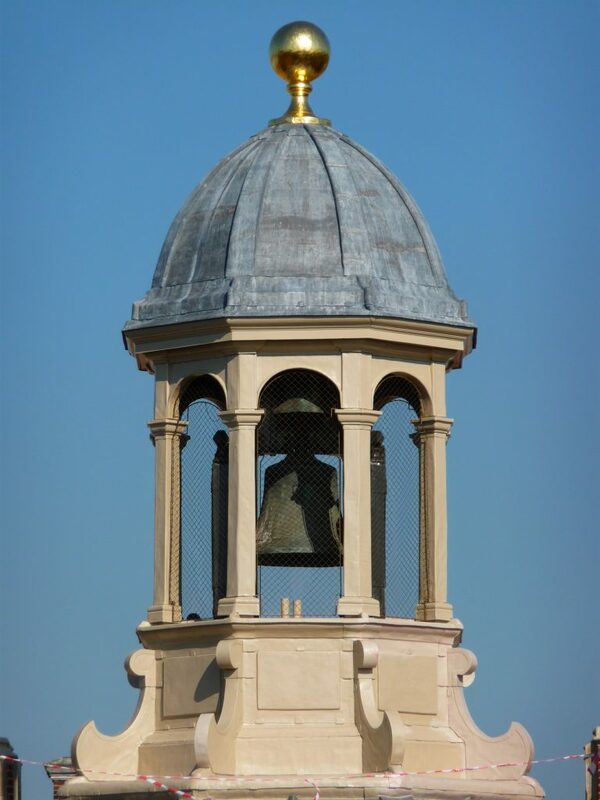 Christopher Wren’s baroque lantern was completely overhauled. 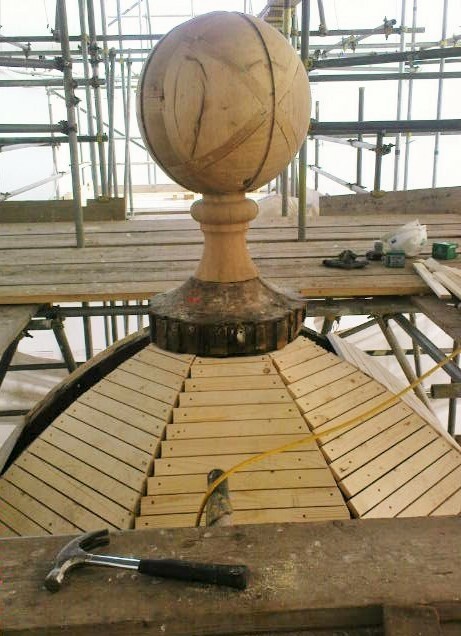 Its decayed ball finial was replaced, with a new one replicating the unusual hollow original. 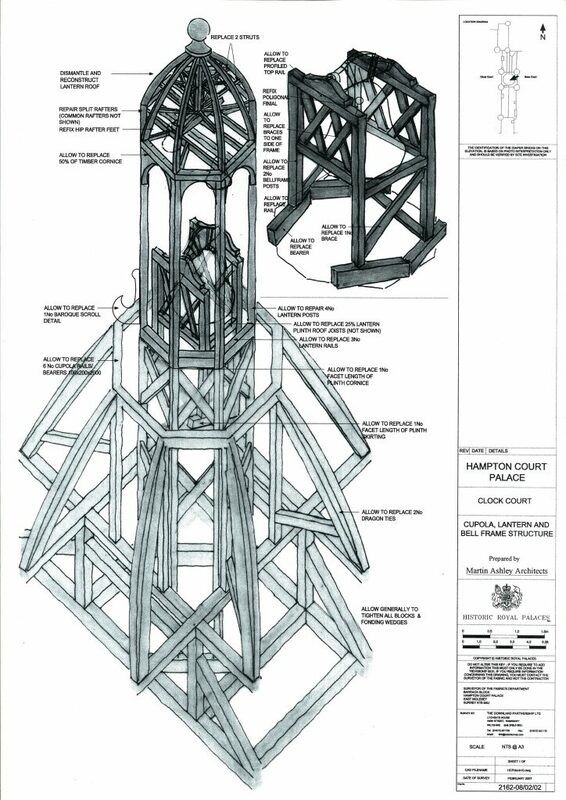 The lantern was stripped of its lead, before timbers were repaired or replaced with replicas based on existing carpentry. 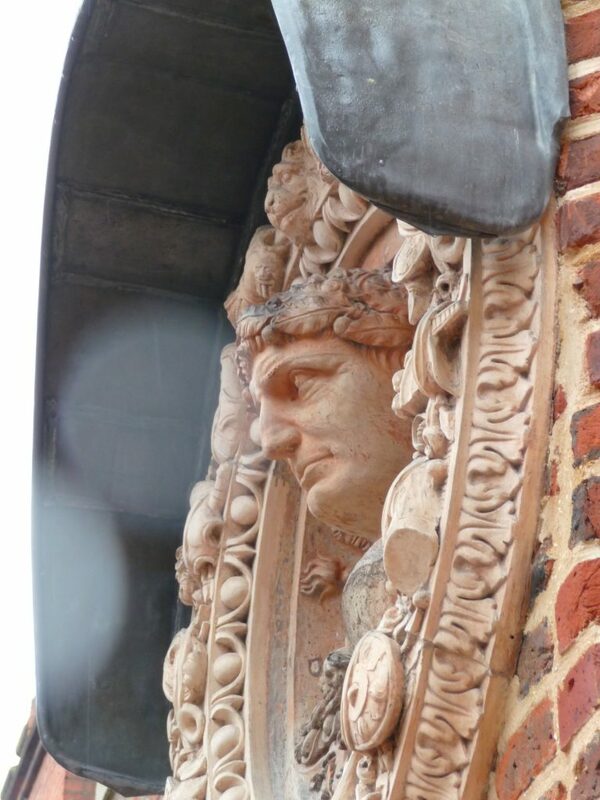 While the leadwork had performed well, some splits had occurred, and a 1930s conservation had used asbestos which, together with lead carbonate dust and guano, required specialist decontamination. Almost all lead details were changed to some extent, while remaining as faithful as possible to their original appearance. 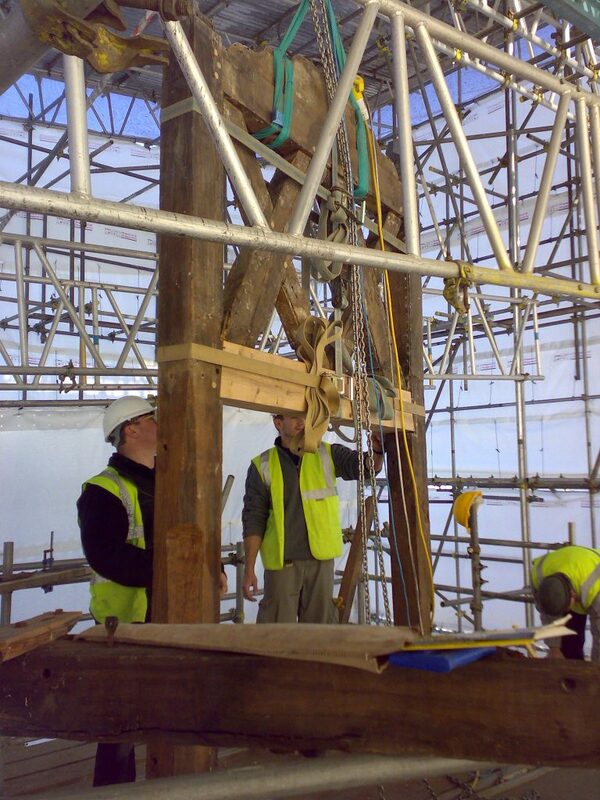 The precise location of some laps were shifted to avoid nailing into fragile timbers or lead becoming trapped beneath timber cornices. 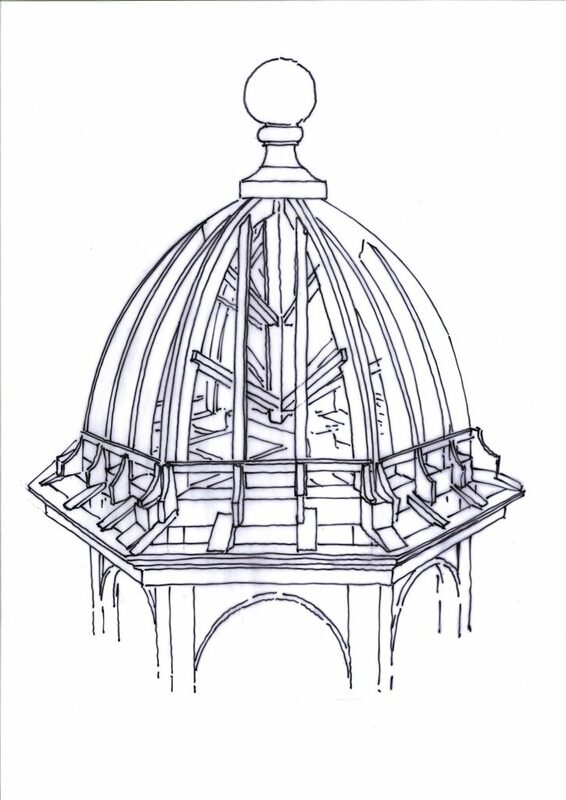 Fragile sarking was replaced with battens to bear the new lead and to allow the curve of the roof and cupola to be followed without splitting. 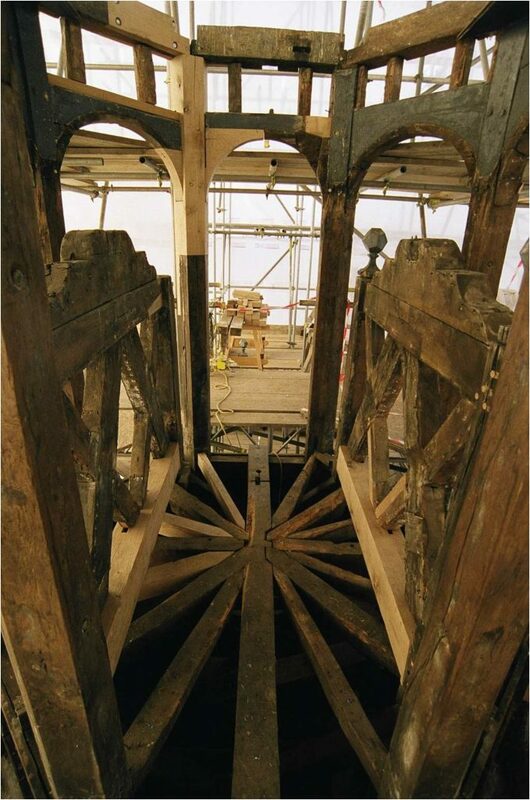 A fortunate discovery of original lead paint on a discarded piece of timber revealed the lantern’s original colour scheme, which was then replicated.